Patrick & me on the Mt. of Olives. 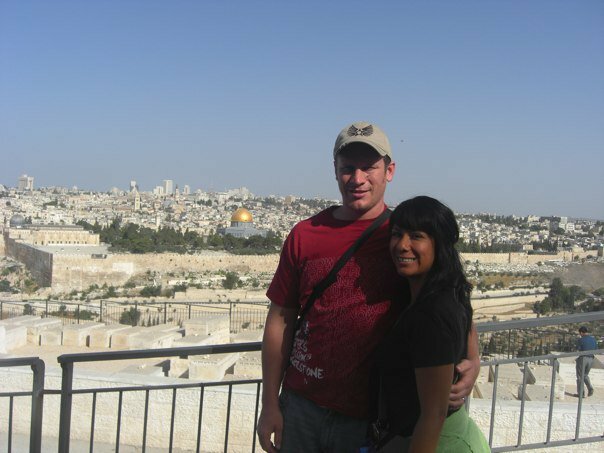 Our first trip to Israel. I’m sitting with my family of four in our tiny 2-door Honda Accord driving through Kansas City. Our car is loaded down with everything we need for five weeks of life and ministry. In the next five weeks we are schedule for over 20 meetings in six states. Just a few hours ago I was finishing up the last few of our dirty dishes before locking up our house to leave. I was listening to CFNI’s You Are Holy when I was overcome by the powerful sense that I was preparing to do the very thing I was born to do. I’m not talking about that thing that wedges itself into your heart and mind when an inspirational speaker at youth camp preaches a message about dreams. I’m talking about actualizing my role in God’s plan on the earth. We will spend the next five weeks speaking to young adults about God’s heart for Israel. We will be teaching them what the Bible says concerning Israel and equipping them to stand with and bless the nation of Israel the Jewish people. No. I’m not Jewish. I’m Mexican-American. Well then, did you grow up around a lot of Jewish people and Jewish culture? No. I grew up in predominantly Hispanic neighborhoods and can’t remember having even one Jewish friend while I was growing up. Well, then why Israel? Why do you love the Jewish people so much? What’s the deal with Israel? I love Israel and the Jewish people so much because when I was four years old I met and fell in love with a Jewish rabbi named Yeshua, Jesus. At the same time I met and fell in love with His Bride, the Church. And as I learned to walk with Jesus I also fell in love with His Word. And as I read through His Word I find that from Genesis 12 through Revelation 22, God is speaking to Israel, about Israel, or giving us instructions for living because those who have received Jesus as Lord and Savior are grafted into the Olive Tree, Israel. 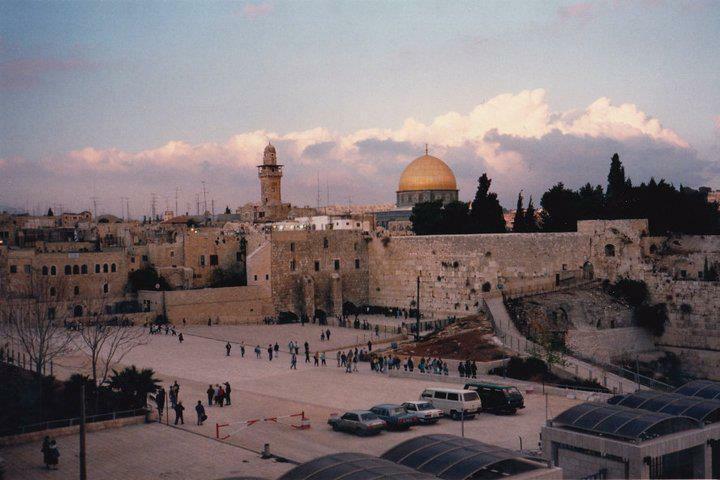 If I had to pin-point one specific time when I began loving Israel I would have to go back to some of my earliest childhood memories growing up in church. I loved hearing the Bible stories taught each week in Sunday School. And I especially loved the flannel graph pictures. One of my favorite stories was the story of Peter’s restoration over breakfast after Jesus is resurrected to life. I remembering thinking about how great it would have been to be alive during Bible times living in all of the places I heard about from my Sunday School teacher. I remember the excitement and jubilation that always enveloped our church during the Easter season as we prepared for our annual Easter production; the costumes and music, and the massive sets constructed to turn the entire sanctuary into a Jerusalem market place. It was all so exciting! Little did I know that the Lord was beginning to plant the tiniest seeds and that one day they would flower and bear fruit. I had read that verse and heard it quoted thousands of times since I was a little girl. There was even a popular song on Christian radio when I was kid that said “Pray for the peace of Jerusalem.” So I’m sure I had even sung those words before. But this time I knew that something significant was set in motion when my eyes fell on those words. I’d like to say that I immediately began studying everything I could about Israel and Jewish culture and that I even began taking courses in conversational Hebrew. But I didn’t. The truth is, I didn’t do one single thing in regards to Israel for a lot of years. However, I always knew Israel would play out in some way in my life. I spent the next 12 years of my life working for and directing an intense discipleship and ministry training school for young adults. I met and married my husband and we had our two daughters and we worked hard and gave of our time and energy and resources to discipling young people. We loved our ministry and the young people we ministered to very much and never would have chosen to leave it or them. However, in 2007, the Lord used a series of painful events to show us that our time there was done. We graduated our last class that May and instead of sending our resume` out to other churches we believed we were to wait. Wait for what? We were not sure except that we knew God would direct us. We spent some of the darkest days of our lives from 2007-2009. We experienced what felt like the death of our ministry, a horrible miscarriage, painfully critical words from people we loved, and destructive, invading lies from the enemy during that time. I can recall many dark moments with my face buried in the couch as I screamed at God for abandoning me. And then I would feel so heavily condemned for those thoughts that I’d end up with my face in the couch again, this time begging God for His forgiveness. It was at the end of this dark period, when we were sure that we would never do ministry again, that we were introduced to Bridges for Peace. We were invited to attend a conference in Florida. We had every intention of going, but then time got away and our lives got busy. Our oldest daughter started school that fall, my grandfather got deathly ill and we had to drive to California, and then there was the constant lack of finances. About one week before the conference, as we were packing to go to California to say our good-bye’s to my grandfather, we got a phone call. The gentleman on the phone began telling me that funds were raised to fly both me and Patrick to the conference and to cover our conference registration, which included an evening at Disney World. After a quick conversation where I was told to expect another phone call where I would be given flight information I sat on my couch thinking Who are these people?! Funds were raised? By people we had never met before? A few days later, and still under a very dark cloud, we found ourselves in Cocoa, FL hearing a message that we had never heard before. We were hearing and reading scriptures and passages that we had read and heard since we were both children. But we had never had them presented this way. And the more surprising thing was that they were making more sense to us than ever before. We received hours of teaching and never grew bored. We were the foolish ones sitting at the edge of our seats with our mouths wide open in awe. I felt, for the first time in my life, the Word of God as a double-edged sword. I could almost physically feel it piercing to the division of my soul and spirit. It was just the Word. But it wasn’t presented as symbolic or allegorical. It was presented as the history of an actual people and an actual Land. And it was presented as prophetic word concerning an actual people and an actual Land. And I was taught that it was my history and prophetic word concerning me because I’ve been grafted into that people. The Word became more exciting to me that night than ever in my life. The next morning we were in a time of prayer for Israel. I’ll be honest, I was a bit intimidated. I hoped we wouldn’t have to lead out loud. I had been in church my entire life and now I was wondering How do you pray for Israel? I knelt at the altar silently listening to the prayers in the room. And then, feeling no pressure to, I began crying out to God. I don’t remember what I said word for word, but it had to do with all the years that I spent discipling young adults and how I had missed a vital part of God’s Word – His heart for, words to and about, and His plan for Israel and the Jewish people. Patrick & I decided that if God ever chose to put us in a position of influence with young people again our focus would be the entirety of His Word; which from Genesis chapter 12 to Revelation chapter 22 is centered on Israel. So, here I am watching the sun set over the plains of Kansas heading to Colorado. The Eastern Gate from the Mt. of Olives. 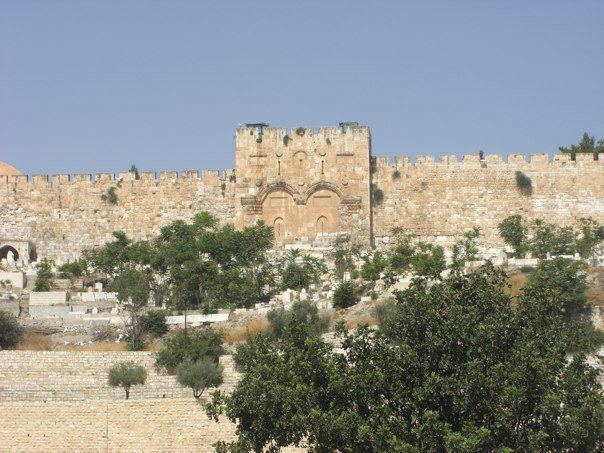 Jesus will return here and enter the city through these gates!